The purpose of this page is to capture some of the memorable programs and activities of the past. You will perhaps forgive me for putting up the material from my own presentation first. I do this not out of ego display, but because I have the material at hand from my personal website ( www.s-i-inc.com ). On January 9, 2013 Robert Schuldenfrei presented The Trials of Lew Wallace. On February 10, 2010 Robert Schuldenfrei presented Manna From Heaven - Northern Supply 1861 - 1862. We now have my two lectures up as YouTube videos. The first is the above mentioned presentation. The second is the April 2012 meeting about supply in the South. YouTube videos. Cathy Clark gave her Widow of the South presentation on September 15, 2010. 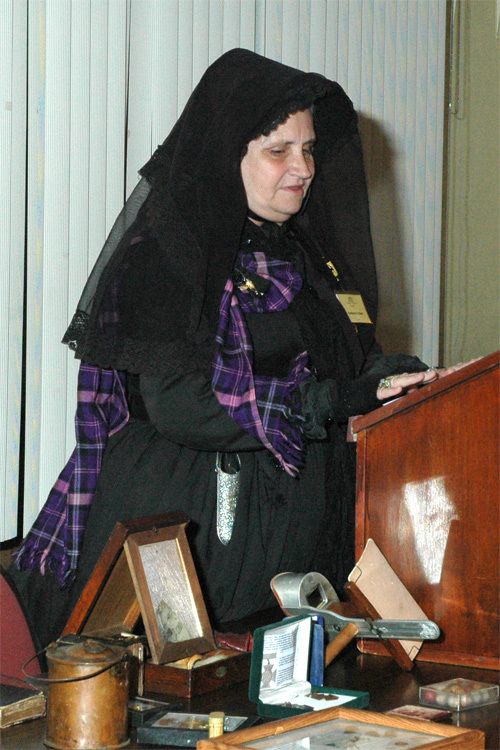 She delved into southern mourning customs during her living history lecture.